I hope you’re somewhere where a sudden outburst of joyful tears won’t get you in trouble, because it’s going to happen when you hear this: when a billionaire who owns an electric car company came out and admitted he was having trouble delivering cars, incredible, heroic strangers heard his cry for help and stepped up to the challenge! 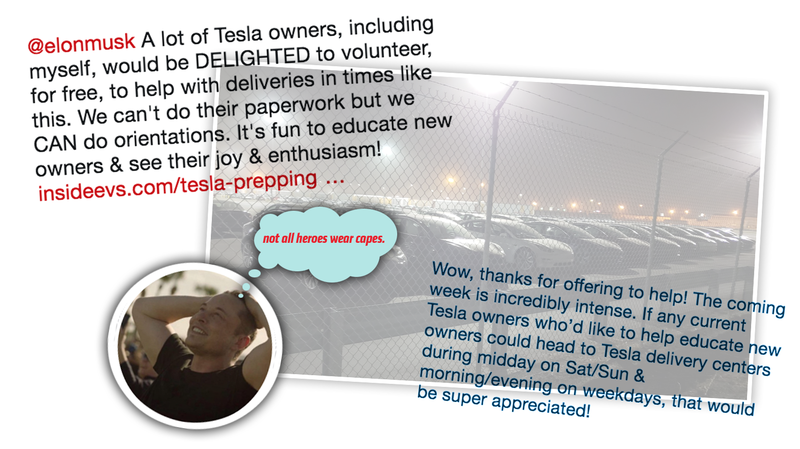 Not only did this selfless knight step up, but the grateful billionaire did the incredible and accepted not just his free labor, but the free labor of many, many other generous, giving fans, all willing to pitch in to help this desperate and noble for-profit company, likely the dominant company in the field of electric cars and one of the top-selling luxury brands in the world, get its precious products out to new adoring fans. YES. THIS. Beautiful, giving people, volunteering their own time to help a for-profit (well, hypothetically—the sweet, poor company hasn’t even yet turned a profit!) corporation is pretty much what the greatest potential of what humanity is all about, isn’t it? Giving. Giving selflessly to those who take. Keep in mind, these hero volunteers are doing this after they’ve already done so much to literally save the world by buying a very nice car and then getting really into the brand, making it a core part of their identity and deciding to make a pledge to never shut up about it! Angels are real, people. And they drive Teslas.